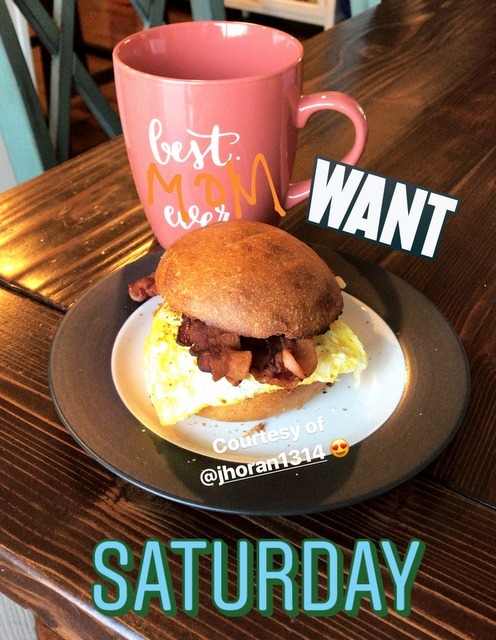 Can I just say that I would really love for my husband to make my breakfast like this every single morning? I mean, that’s not so much to ask, riiiiiight? 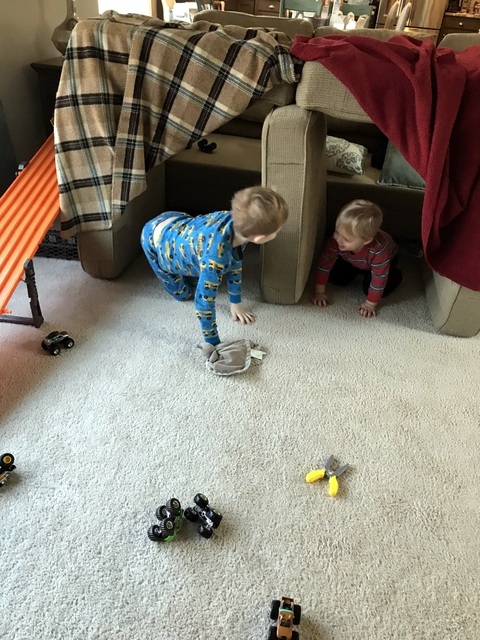 It wasn’t a very nice day to be outside, so we did what we could to have some more fun indoors…and pillow forts are always a guaranteed good time for about five minutes. 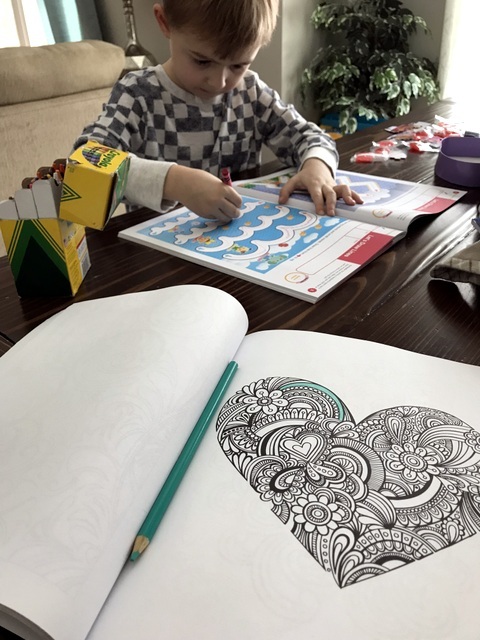 I was also thrilled when Lucas decided he wanted to do activity books/color, because I’d been dying to just sit and color lately! 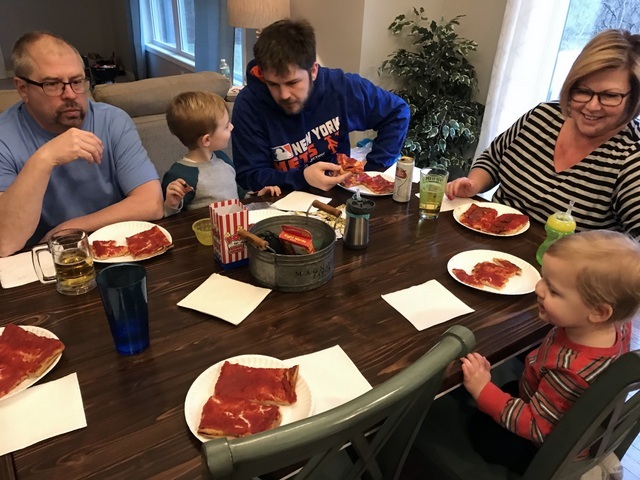 And later Saturday afternoon, we got a visit from my brother and my parents, who just so happened to bring by a couple of pizzas (COB pizzas from Redfront, for those of you locals…the BEST!) for dinner. It was a good night, the adults got to have a couple drinks, and the kiddos loved seeing their Nan Nan, Papa, and DooDee. 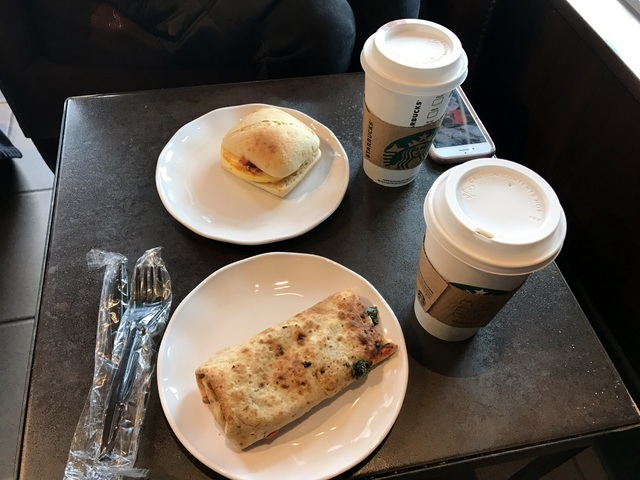 On Sunday morning, I had a LONG overdue Starbucks date with my friend, Heather. It was so nice to just hang out, chat, and catch up, although I did feel like I had to apologize at the end of our visit because I felt like everything I had to share/catch up on was total “Debbie Downer” (hospital trip for Alex, hit a deer, kiddo struggles, everyone sick for months, just to name a few!). I started thinking about it more on my way home, and although – yes, we have had a tough winter – I really do need to try to start looking more at the positive. So I intentionally made it my goal to keep looking on the bright side of things for the rest of the day/weekend, and we all had a great day (and hey…dare I say, we’re maybe even approaching the tail end of this current cough/cold?!). WOO HOO! 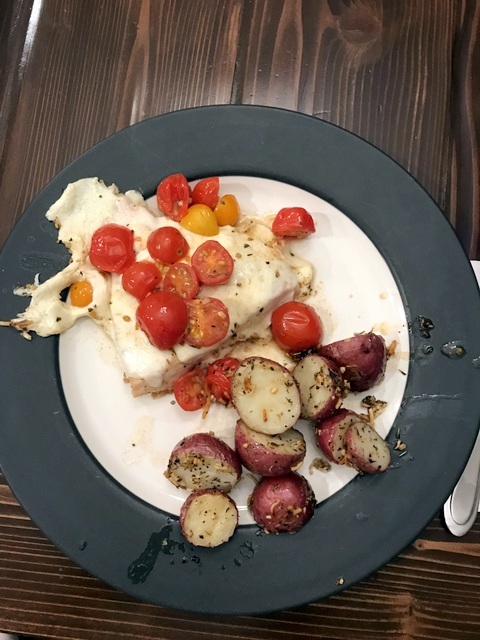 OH, and we also made the most delicious Sheet Pan Bruschetta Chicken recipe (sorry, mine does not look pretty!) which I would highly recommend. As for Monday, unfortunately Jay didn’t have the day off from work, but the boys and I all had a great day together. 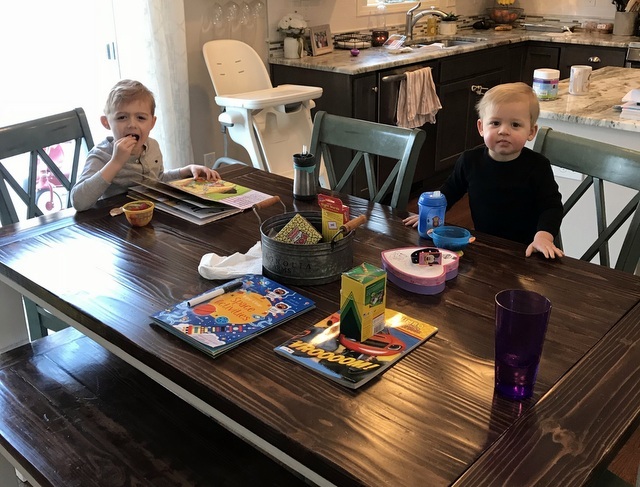 And by the time Monday night rolled around and the boys were in bed, I even took some time to finally paint my nails (I’d been waiting because I felt like I was washing my hands triple-time lately with all the germs) and get in a little more coloring. Does anyone else find coloring just super relaxing?! And that pretty much gets us caught up from the weekend! How about you guys? Anyone else do anything fun or have any fun plans coming up this week (I know schools are closed this week for winter break here!)? I love the attitude shift! Our week is pretty routine over here- but I'm loving the Olympics! If there’s one thing I cannot do in this world, it’s paint my nails! While I’m all about the positive, but girl, you had a winter. After major moments Ike you had it’s nice to reset with afresh mind and attitude. Hey Courtney! 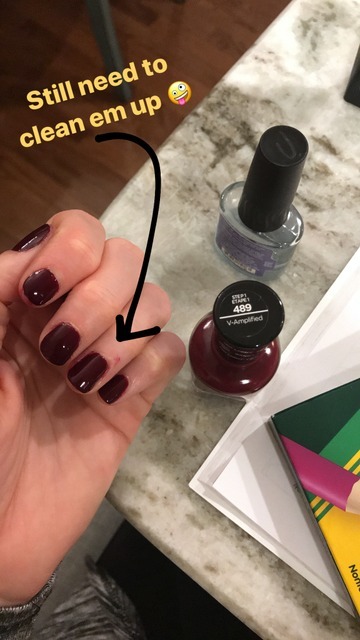 Have you tried Color Street polish strips yet? Game changer, especially for us busy moms! I'd love to send you a free sample! Haha YES, we are SO ready!! When i was pregnant with my daughter i had really bad anxiety. To help, My sister bought me a coloring book and i swear, Coloring was my savior, nothing relaxes me quite like it. After she was born I cut out and framed all the pictures I colored and decorated her nursery with them. I had anxiety bad too after my first born! That is a GREAT idea to keep in mind for next time! Were your new car seats covered under you auto insurance claim? I seem to recall that they should be. Just something you might want to look into if you haven't already. Yes! They were, which was great! Haha! YES! 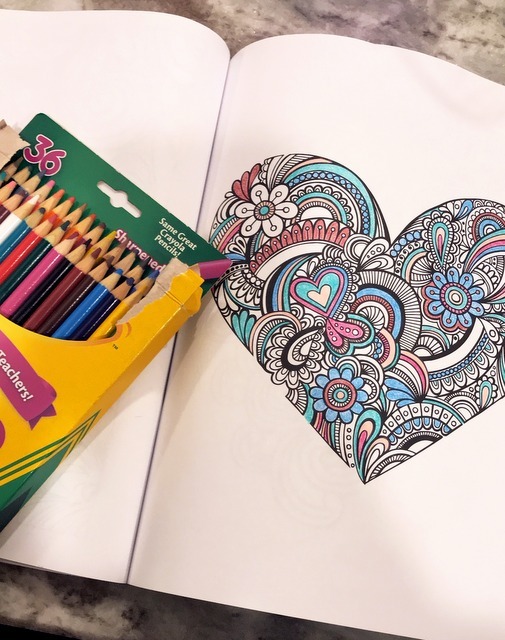 Coloring is so relaxing, and my favorite part is that my eyes aren't staring at a SCREEN! Hallelujah! I love the attitude shift too. 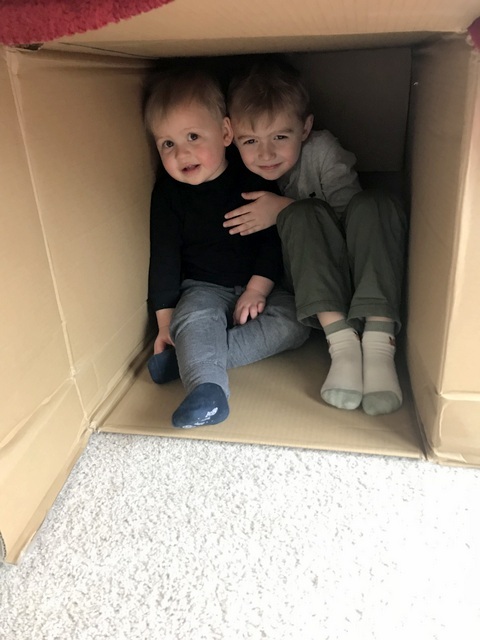 As someone that is dealing with a close family member ( a 6 year old ) battling cancer, I have to say I'm sensitive to the negativity that was coming across in your blog lately. It definitely seemed like you were in the dumps a bit. Not that I don't understand your sentiments, it is just that there is such a great perspective on what a truly bad day actually is, that sometimes it is good to refocus our attention on the things that we should be grateful for. Healthy children tops my list every time! Kate, I am so incredibly sorry to hear about your family member. That is far too young to have to be dealing with cancer, and please know my sincerest thoughts are with you and your family. Healthy children, 100%, is always at the top of my list, too! You have had a rough couple of months, and I think anyone would feel the way you do. I love the positive shift, and I hope it radiates down to me as well. 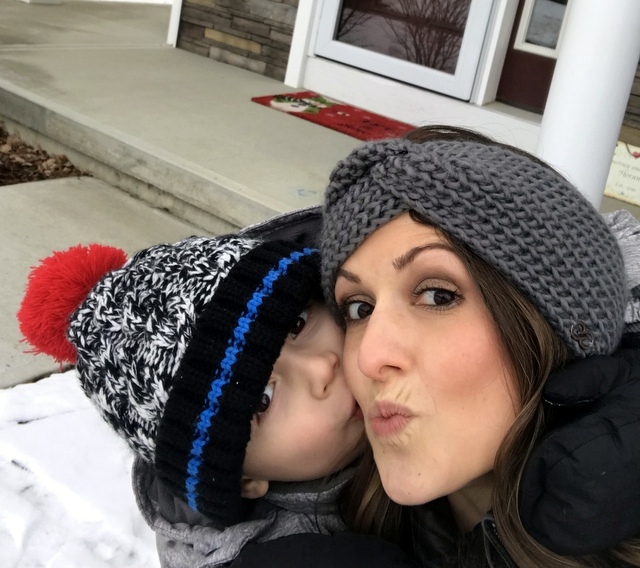 I, too, am a working mom to 2 young kiddos, and with all the sicknesses and craziness of life, it is SUPER easy to fall into a negative trap. I feel like the minute I say something positive, the exact opposite happens LOL So it's easy for me to just expect the worse and be pleasantly surprised when good happens. I realize that is a horrible attitude to have, so I am trying to be more positive. This season has made me especially paranoid about germs and sickness and all the yuck. Just know I feel ya Courtney. So I am excited for this positive embrace and hopefully I can be more positive, too. As for expressing your "Debbie Downer" moments on the blog...go for it! I know we all have hardtimes (some a lot harder than others) but we are still allowed to feel defeated sometimes. You should be able to do that without feeling guilty about it. I enjoy reading your blog. I appreciate that you share the positive and not so positive aspects of your life. Not everything is all sunshine and roses . Thank you for being so relatable. I'm a born and raised Troy, NY girl and just moved up to Vermont with my fiance in September and I cannot tell you how much I miss COB pizza and Red Front overall!! I haven't found anything that compares here so far.